After reporting on my reading goals last month, I realized that I needed to check off a few more of my goals pronto. I already had The Magician's Nephew from the library, and with my newly-acquired, super-fast listening skills, I blazed through it almost before I could blink. It was a fabulous book. When I read The Silver Chair, I was pretty sure it would be my favorite in the series. But then The Horse and His Boy surprised me by so completely surpassing my expectations that I thought the last two books would have to be disappointing by comparison. 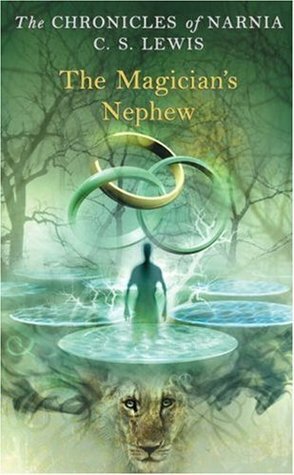 I can't speak for The Last Battle yet, but The Magician's Nephew was so wonderfully different from the first five that I immediately fell in love with it. I'm tempted to say it's my favorite one so far, but then again, I think it might be impossible to choose a favorite. That, and I'm still basking in the glow of having just finished it, so I don't think I can offer a reliable opinion at this point. Maybe when I'm completely done with the series. This story begins well before Lucy Pevensie's fateful step into the wardrobe. It stars Digory, a young boy who has come with his ill mother to live with his aunt and uncle, and Polly, the girl who lives in a nearby apartment. One afternoon when Digory and Polly are exploring, they stumble unexpectedly into Uncle Andrew's forbidden room. Uncle Andrew, an amateur magician of sorts, is only too happy to have a couple of guinea pigs and soon convinces Polly to take up a beautiful yellow ring. Upon touching it, Polly instantly disappears, and Digory is left with no other choice (much to Uncle Andrew's delight) than to go after her and bring her back. Their adventures take a definite turn for the worse when they unleash the Empress Jadis from a powerful spell. Within minutes, she is on a quest to conquer the world, and the children are baffled how to stop her. This story answers a great number of questions about how Narnia and the White Witch and the wardrobe came to be. Because it is a prequel to The Lion, the Witch, and the Wardrobe, it is now most commonly placed at the beginning of the series and read first. I think this is a grave mistake. Just as this book sheds new light on Narnia and its characters, knowing what's to come also provides a certain amount of insight into the events in Digory's story. For my part, I think I would have enjoyed reading this book far less if I hadn't read it against the backdrop of the six previous books. I've been reading the whole series in the order of publication, and up until The Magician's Nephew, it didn't really seem like that big of a deal. But now it does. Putting The Magician's Nephew at the beginning rather than the end would provide a completely different reading experience. Maybe there is merit and value to both orders, and I have a feeling this topic could evolve into an entire blog post of its own, but I am going to make my stand firmly in the camp of publication order. Anyone else with me? This is the only Narnia book where an adult (actually three adults) cross the barrier into the Narnian world, and it introduced some unexpected twists to the plot and also a great deal of insight. I was especially interested (and at times, amused) by Uncle Andrew's reaction to this new, unimagined world. Even though it was he who was playing with magic that resulted in them all (Digory, Polly, the cabby, Strawberry (the horse), eventually the cabby's wife, and himself) being transported to Narnia, he resisted it the entire time. Rather than embrace what he was seeing, he chose to ignore or fight it. One of the scenes that affected me the most was during the creation of Narnia. Under Aslan's song, the trees and animals began to appear, and Uncle Andrew shut himself away from the experience. [Uncle Andrew] had disliked the song very much. It made him think and feel things he did not want to think and feel. Then, when the sun rose and he saw that the singer was a lion ("only a lion," as he said to himself) he tried his hardest to make believe that it wasn't singing and never had been singing - only roaring as any lion might in a zoo in our own world. "Of course it can't really have been singing," he thought, "I must have imagined it. I've been letting my nerves get out of order. Who ever heard of a lion singing?" And the longer and more beautiful the Lion sang, the harder Uncle Andrew tried to make himself believe that he could hear nothing but roaring. Now the trouble about trying to make yourself stupider than you really are is that you very often succeed. Uncle Andrew did. He soon did hear nothing but roaring in Aslan's song. Soon he couldn't have heard anything else even if he had wanted to. Sadly, Uncle Andrew's experience struck a chord of familiarity within me. As I grow older, I find myself growing more and more skeptical and less and less trusting of experiences I have. I witness miracles and then in the next moment think, What a lucky coincidence! Sometimes, I'm hesitant to acknowledge the hand of the Lord in case I'm being naive. And sometimes I'm afraid to trust because it makes me feel vulnerable. Seeing Uncle Andrew's behavior helped me look at my own doubts and fears a little more honestly, and I realized that it is so easy to let those doubts and fears overcome good judgement and common sense. It reminded me of this quote by Elder Jeffrey R. Holland that I have thought about continually since he said it in last April's General Conference: "Honestly acknowledge your questions and your concerns, but first and forever fan the flame of your faith, because all things are possible to them that believe." As silly and ridiculous as Uncle Andrew was, he really embodied the qualities that so many adults have today as they rely heavily on only logic and evidence. There were many other moments of wisdom throughout the story (another favorite (said about the fruit of the tree): "All get what they want. They do not always like it. "), and once again, I was amazed at the quiet symbolism that was unpretentiously waiting behind a really great story. Some think that this was the hardest book for C.S. Lewis to write because it took him so long, and he left it several times to work on other things. Regardless of whether or not that is true, it does seem plausible that the other books influenced this one and that the plot and pacing and structure probably changed over time. If Lewis had finished (and published) it before writing the rest of the books, I'm sure it would not be the same novel we have today. And what a tragedy that would be. I read this one first, a long time ago, but never really got to the rest of the series. I'm hoping to remedy that with a Narnia reading later this summer, and this time I do plan to read them in order of publication. Both you and my husband have advised it, and I'm interested to find out how my experience of this book differs after I've read most of the other Narnia books first. I'm interested to hear what you think after you read them! Very interesting...I also read The Magician's Nephew years after reading the whole series first. I really enjoyed it too. I then read the rest of the books after The Magician's Nephew and the only one I really, truly oved was The Lion, The Witch, and the Wardrobe. The rest of the books were "meh" for me. It's kind of sad because I remember loving the series as a child. I think we see the world so differently when we are older. Great quote that you chose! Interesting. I would say I've had the opposite response: I couldn't get into the books as a child, but I'm loving them now as an adult. I think I'm able to appreciate the symbolism so much more. What a beautiful review. I've been meaning to read it. I loved all the books as a kid, but loved them even more when I re-read them as an adult. The Magician's Nephew, The Horse and His Boy and Lion, the Witch and the Wardrobe are my three favorites. I think it's interesting to learn the order that Lewis wrote them in!